The hack is indeed a genius, however, it is equally funny! 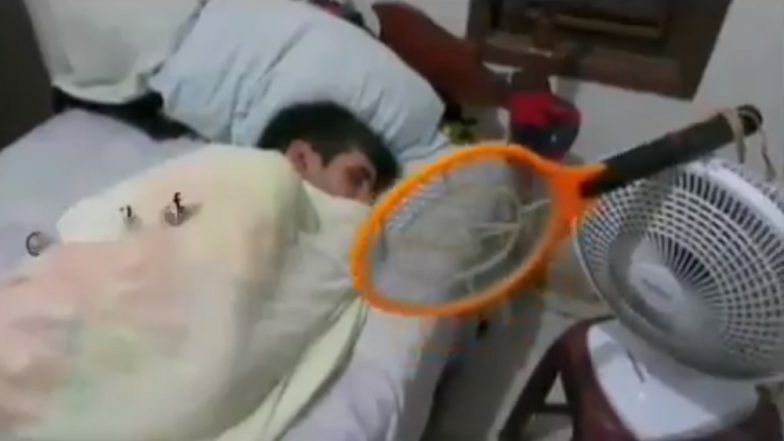 Feeling really bad for this guy who can't afford a ₹350 mosquito net but have all the modern gadgets to deter moaquitos. Oh! This is a valid point. But you have to press down the button for the current to pass from the racket? How'd he do that? Such viral hacks are super entertaining. On a serious note, various herbal oil or essential oils can come to your rescue such Lemon Eucalyptus, Catnip Oil, Peppermint Oil and Lemongrass Oil. These oils are known to shoo the mosquitoes away.